I love when I have a polish on my lust list and when I finally get it – it is everything I wanted and more! I’d had my eye on Fall Semester since it was released and was pleasantly surprised (maybe thrilled!) to receive it during a Christmas polish swap. 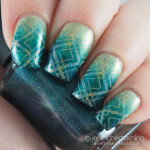 Fall Semester is a dark teal linear holographic polish. Seriously, this is one of those polishes that I feel like was meant just for me. Everything I love in one cute bottle! The formula was very nice and smooth and reached full opacity in two coats! Of course, the review wouldn’t be complete without a glorious sun shot to really show off that holo rainbow! I looooove this polish! It went on and wore like a dream, definitely worth the investment!